Political campaigns use massive databases to target their constituents. ProPublica's Message Machine is beginning to find some answers on how they do it. January 3rd, 2013: This article has been corrected. On Aug. 7, Mel Roseman, a retired school teacher in Los Angeles, received an email from the Democratic Senatorial Campaign Committee asking him to give a political donation of five dollars. Fifteen minutes later, he received another — almost identical — email, sent to the same address. But the second email asked him for $25. Because Mr. Roseman volunteers for a non-profit internet service provider, he told us, “I receive more than one hundred messages a day, but I didn’t pay any attention to” the messages from the DSCC. At least, until he signed up for ProPublica’s Message Machine. In this campaign season, ProPublica’s Message Machine project has collected more than 30,000 political emails, and identified more than 2,000 distinct mailings with more more than 4,000 variations. For each email blast, the Machine creates a computer model using an artificial intelligence technique called a Decision Tree. 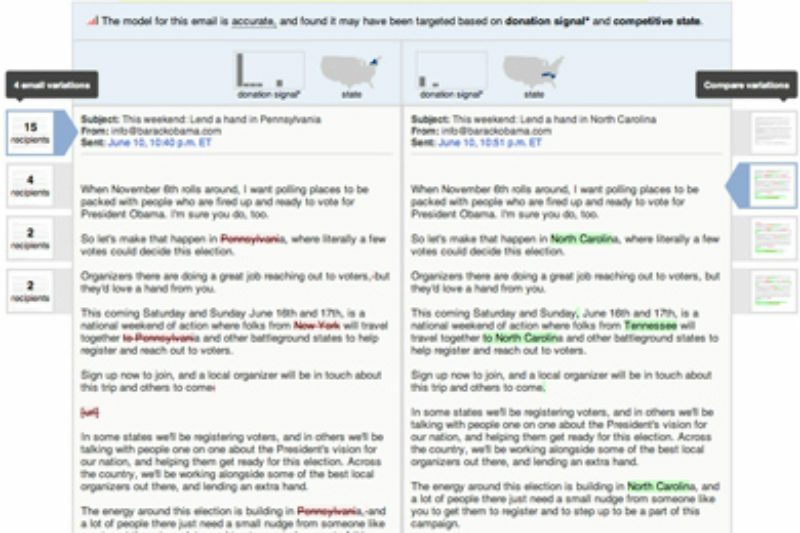 These computer models provide hints about the ways that political campaigns microtarget their constituents to optimize donations or some other political activity. Today, you can view the results of these models. As of this writing, the Machine’s most confident about its models for the Obama for America campaign, though it creates a model for every email from every campaign. Each email in Message machine has an icon denoting the strength of its model. The amount of data in the Message Machine represents a very small sample of the enormous databases assembled by the campaigns and parties. The model for each email represents our best attempt to understand how the campaigns’ decide which constituent receives which version. The models will get better when they are trained with more data, so if you receive emails from campaigns, forward them to [email protected]. For the more mathematically inclined, we’ve got a full explanation of our methodology. Across all campaigns in the Machine, the most significant difference between emails in a single message blast is perhaps unsurprising: campaigns change the amount of money they ask for based on how much you’ve donated in the past. In Obama for America’s case, many emails contain a “quick donate” box that asks for more money when a particular constituent saves his credit card information. Because only previous donors see this box, we use it as a signal that the recipient has given money in the past. While coverage earlier this election cycle noted the prevalence of the $3 donation request in Obama for America’s emails — Politico called it a “magic number” — this small request is just for starters. Some Obama supporters who had previously donated are often asked for $500. Along these lines, Obama for America sent emails to supporters from the 2008 election who donated more than $2,000 that cycle, asking for them to match their 2008 support this election cycle. But supporters who donated any amount in 2008 have caught the campaign’s eye: like this message, asking 2008 supporters to “chip in” sent on July 29. For its get-out-the-vote operations, Obama for America also targets supporters based on their physical location. Voters in swing states can receive slightly different messages than those who live in safer states. In many email blasts from Obama for America, the campaign urges voters from non-swing states to travel to competitive neighboring states. The Obama, and Romney campaigns did not respond to requests about exactly how much they spend on their email operations. An analysis of Obama for America’s emails indicate they send most messages from Blue State Digital’s servers. According to FEC filings, the campaign has paid Blue State Digital more than two and a half million dollars for that service, since 2011. A similar analysis of the Romney campaign messages show that they send their emails from servers run by Targeted Victory, a firm founded by Zac Moffat, who is now Romney’s digital director. This election season the campaign has paid Targeted Victory more than thirteen million dollars, which includes some ads bought by Targeted Victory on behalf of the campaign. The DSCC did not respond to a request for comments about this story. The Message Machine will continue to collect emails through the rest of the political season and beyond. Our code will get better at finding targeted emails as more data comes in. If you get campaign emails and would like to discover how the campaigns are targeting you, please forward your political emails to [email protected]. Correction: This article originally stated an email sent by Obama for America on May 29th, with the subject line "Good Morning" was targeted based on age. Amelia Showalter, OFAs director of digital analytics in 2012, informed us that that email was sent to random segments, and that "fundraising emails were virtually never targeted based on age." That paragraph has been removed.